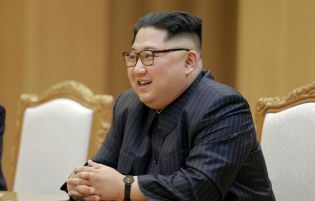 (CNSNews.com) – Any denuclearization deal the United States strikes with North Korea will differ from the disarmament of Libya 14 years ago because it would entail Kim Jong Un remaining in power, and presiding over a country enriched as a result of the agreement, President Trump said Thursday. Speaking to reporters alongside NATO secretary-general Jens Stoltenberg, Trump said the so-called “Libya model” was not under consideration with North Korea since the agreement with Libya did not include security guarantees for Muammar Gaddafi. “There was no deal to keep Gaddafi” and the country was “decimated,” he said, in reference to the 2011 NATO airstrike campaign that helped bring an end to the Libyan dictator’s four-decade rule. Seven years earlier, Gaddafi had agreed to relinquish his nuclear, biological and chemical weapons programs. North Korea this week raised doubts about a planned summit next month between Trump and Kim Jong Un, and among other issues expressed anger at suggestions – by National Security Advisor John Bolton – that a Libya model may be followed in North Korean denuclearization talks. Bolton’s references in media interviews to a Libya model have related not to Gaddafi’s ultimate fate, but to technical details of a disarmament deal. He pointed for example to the total access Gaddafi had given to Western officials, and to the fact that his WMD programs were shipped in their entirety to the U.S.
Trump also suggested that the absence of a denuclearization agreement with North Korea would be more likely to result in the end of Kim Jong Un’s regime. The North Korean regime views U.S. treaty alliances with South Korea and Japan as an implicit threat to its survival, and for decades has made its willingness to negotiate on its nuclear programs contingent on “security guarantees” from the U.S.
North Korea this week canceled planned talks with South Korean officials, citing ongoing U.S.-South Korean joint military exercises. A propaganda website on Thursday ran a commentary saying that dialogue and wargames – which it described as “a rehearsal for invasion of the North” – could not exist side by side.